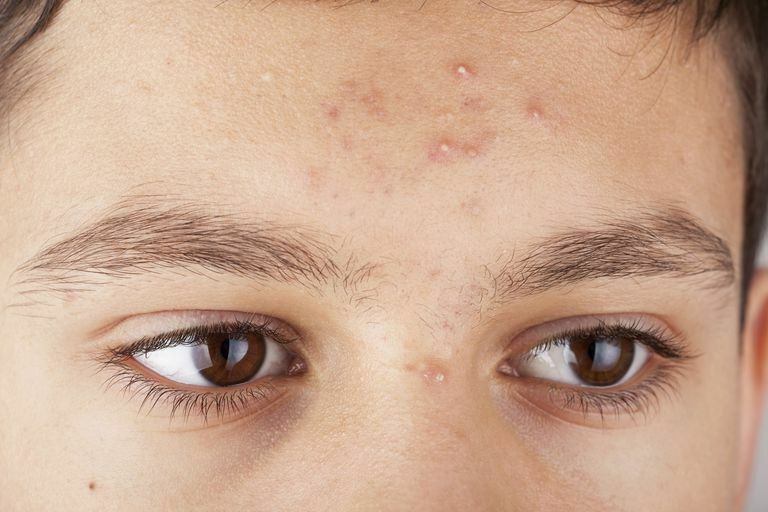 A pustule is a red, inflamed acne blemish with an obvious white top or head. That whitehead is filled with pus, oil, and cell debris. Pustules are what most people consider typical pimples. We also call these blemishes zits or whiteheads. Almost everyone has had a pustule at some point in their life. They're common acne blemishes. Pustules begin as a small plug of skin oil (called sebum) and skin cells within the pore. As it becomes engorged with this excess material, the pore wall can rupture. This break leaves the pore red, swollen and sore, creating a papule. As white blood cells rush in, pus forms, creating that obvious whitehead. The papule has now become a pustule. Sometimes the head of the pustule isn't white — it might be a cream to yellow color. You may also see a brownish dot in the middle of the whitehead. This brown spot is the comedonal plug. All of these things are normal. Got a Whitehead That Isn't Red and Inflamed? Maybe you have a whitehead that isn't red, inflamed or sore. If your whitehead is more like a hard, little white bump, it's probably not a pustule at all. These blemishes are actually called milia. They form differently than pustules. While a good portion of the whitehead in a pustule is made up of pus, the whiteheads of milia are not pus-filled. Instead, it's a plug of sebum (or oil) that has become trapped under the skin's surface. Milia are treated differently, too. Got a Blemish That Is Very Large, Hard, and Painful? Some pustules are small, some pustules are fairly large. But if your pustule seems especially big, it may be a more serious type of lesion. That whitehead may actually be a boil. Boils look like pimples on steroids — they're exceptionally big, red, swollen and painful. If you've got a "pimple" in a weird place, like your underarm, suspect a boil. Boils and acne pustules have different causes, and they're treated differently too. So, it's really important that they're appropriately diagnosed. But, of course, talk with your doctor if you're unsure or if have any questions. Pustules are the types of blemishes that we're most likely to squeeze. It's never a good idea to pop any blemish, pustules included. Squeezing a pustule can push all the infected material deeper into the pore. Do this, and you'll end up making the breakout look and feel much worse. You can also cause a scar. But, since no one likes to walk around with a big whitehead on their face, you can try using a warm compress to help it drain. It's much more gentle on the skin than squeezing. If you only get an occasional pustule, you can help it heal more quickly by applying an over-the-counter acne spot treatment that contains salicylic acid, sulfur, or benzoyl peroxide. But if you regularly break out, you'll get much better results by stopping those blemishes before they even start. For mild breakouts, over-the-counter acne products can do the trick if you use them daily. More tenacious breakouts will do best with prescription acne medications. If you need help getting your acne under control, or even just planning a treatment routine, make an appointment with a dermatologist. Lavers I. "Therapeutic Strategies for Acne Vulgaris." Nursing Times. 2013 Dec 4-10;109(48):16-8.